A brief discussion of some of our experiences while living and traveling in Michoacán, Mexico. Have you ever looked at a Mexican travel brochure? If you have there is a very good chance that is includes photos of the dance of the old men (los viejitos) or of women during the night of the dead (noche de los muertos). Invariably these are photos of indigenous events and peoples and they are presented as representing the “soul of Mexico”. How did this come about? The mystery in suggested by contradiction of the “soul of Mexico” and the reality which sees the indigenous peoples on the margin of society, having little or no representation in positions of power and being the poorest peoples in the nation. How can they be on the margin and yet representing the essence of what it means to be Mexican? To unravel this we have to go back to the end of the revolution of 1910-1920. The revolution of 1820 was a fight to achieve independence from Spain and its conclusion left power in the hands of the rich and well connected and often the children of Spanish parents. The next 100 years were about the powerful trying to create a state, a difficult task in a country as varied as Mexico with about 60 different languages and having a terrain which led to isolation of groups and created barriers to the imposition of a centralized state. The revolution of 1910 was more about bringing democracy to Mexico and creating a nation as well as a central state. To centralize the state it was necessary to weaken and clearly define the role of state and local governments. It also meant ensuring the army was loyal to the central authority and not to local authorities. But the revolutionaries also knew they had to create a nation. A nation depends upon having a shared narrative or myth about who the peoples are, where they came from or what it is that distinguishes them from others. If they can share in this sense of shared community they can be loyal to the state and perhaps take pride in the activities of the state. Without this the country can only be held together by force. This idea is fully developed in Benedict Anderson’s book Imagined Communities: Reflections on the Origin and Spread of Nationalism, 1991. Mexico had seen 200 years of disruption and it was time for a centralized state and a shared image that glued people together. If one looks at the United States of America we find a strong founding myth and a sense of the nation being distinguished by an ideal of freedom and of individual liberty. In Canada the myth is quite different and often difficult to pin down. There is a myth around the nation’s founding but the stronger image comes out of a sense of shared peoples building a life together. Initially this myth involved just the English and the French. It was gradually widened to include the indigenous peoples and since about 1960 it has been a sense of a multicultural society. Many peoples with different cultures come together and with respect build a life together. There is a secondary myth built around the difficulty of building a small nation which in a sense is built sideway rather than up and down, east-west rather that north south. This made it very important that many things be done together. Who is going to build the canals, build the railway, feed the poor? Canada, by necessity became a more cooperative society. It shared aspects of this myth with Europe which came by it through a different route, i.e, the threat of revolution. These narratives or myths do not have to be literally true as long as they resonate with the people. They may even be violated quite flagrantly without damaging the myth/narrative. Think of slavery in the USA, the too frequent hate talk about Muslims and the brutal death of a group of Muslims at prayer in Canada. Now, back to creating the myth. I recently read two books on this topic and will discuss the more academic of the two well as the more local. This is Ruth Hellier-Tinoco’s book, Embodying Mexico: Tourism, Nationalism and Performance (2011) which provides a very well researched and documented study of Michoacán from about 1920 to the present. She shows very clearly how the Island of Janitzio was “discovered” by state intellectuals and the media in 1922 and their realization that both the night of the dead celebrations and the dance of the viejitos could serve much broader purposes for the nation. The context for all of this was the virtual civil war that occurred from 1910-1920 with the overthrow of the Porfirio Diaz (president from 1876-1911) regime. With the new found stability of 1920 came the need for a truly national state and this depended upon Mexicans having a strong sense of who they were and something to share that might provide for unity. In a sense there was a need to create an “imagined community”. President Obregon created the Secretariat of Public Eduction (SEP) in 1920 and in 1921 Jose Vasconcelos became the director of this institution. He realized the important role education could play in building a national community. To start with it would ensure that everyone could speak Spanish but beyond that it allowed a central authority to determine the stories (the curriculum) which was passed to each student. Vasconcleos had a rather ambivalent outlook on the indigenous population. On the one had they were seen as backward and the troubling characteristics of their heritage had to be rubbed out, hence the value of education, and on the other had they had positive characteristic, determined by him, which could be identified and used to create a nation. In the end he believed that Mexico should become a mestizaje nation, one of mixed race. He implemented a program of sending people out to the frontier to gather songs and stories which could be used in education. Into this vacuum and this need came Rubén Campos [musicologist], Francisco Domínguez [artist], Frances Toor [anthropologist], Moisés Sánez [undersecretary of education], Carlos González [also a state representative] and I.L. Kandel [a guest]. (Two of these members received government funds to return to Michoacán in 1923 to collect folklore.) On that night in 1922 they arrived by canoe to the Island of Janitzio in lake Pátzcuaro as simple observers for a short while before returning to shore. The island at that time was not appreciative of visitors and it a marvel that the newcomers were not thrown off; perhaps the visitors were protected by their official look. They managed to take some photographs and saw the night of the dead activities. They also took a canoe to the island of Jarácuaro where they saw the dance of the viejitos (the old men) and in 1924 took Nicolás Bartolo from Jaracuaro to Mexico City to teach others to perform the dance and the first stage event took place that year. Nothing was to be the same and at the same time everything had to be same. Approximately 100,000 visitors arrive each year to observe night of the dead in the region, exactly as did the six visitors in 1922, and the viejitos dance, or their image, is everywhere. At the same time it was important that these two events not change and tourists today can recreated the 1922 trip for themselves. Hellier-Tinoco provides much more detail but the book tends to be written from a theoretical perspective and goes to great length talking about views of, and the importance of, performance. A much broader historical perspective and one that focuses on indigenous art rather than two events can be found in Rick Lopez’s book, Crafting Mexico, 2010 Lopez begins at the same historical moment, the time immediately following the revolution of 1910-20. Vasconcelos is important but much more significant was the contribution of Dr. Atl. His birth name was Gerardo Murillo but he changed it using a Nauhatl name meaning water while living in Paris focusing on his skills as a painter but also keeping an eye on Mexican politics. His new name was a symbolic rejection of his colonial past and signalled a new direction. He returned to Mexico for a few years and participated in the revolution being appointed by President Carranza (1917-20) as Director of the Academy of San Carlos which was to become an important institution in the mural movement. He also received a commission from President Diaz to design a glass curtain for the stage at the Bellas Artes building to be manufactured by Tiffany of France. He also issued a manifesto calling for the creation of monumental art in Mexico and art which portrayed the lives of Mexicans. He returned to Paris briefly in 1911. One of his first students at the Academy of San Carlos was Diego Rivera and Dr. Atl appealed to him to return from Europe to produce art with a Mexican theme. It was unclear at the time just what this would mean but Dr. Atl was clear, Mexcio needed images of the indigenous population (what he came to call Indians) and indeed once the revolutionary dust settled the elite of Mexico were rejecting a Eurocentric view and where coming to think they must find the roots of nation building on the indigenous past of Mexico. They did not mean the peoples of pre-conquest Mexico, rather the living indigenous peoples, the real Mexicans. 1915 Dr. Atl had a proposed an exhibition of handicrafts (what he would come to refer to as art) from indigenous community but this call fell on deaf ears. In 1920 however, the climate had changed and several people were suggesting this for the exhibition upcoming to celebrate the 1820 revolution for independence. Roberto Montenegro and Jorge Enciso (both of whom had also been in Europe) proposed this with the backing of Atl when one exhibition was cancelled and something was required to fill this hole in the agenda. However, no one had a collection of popular arts which would represent all regions of the country. The organizers put together what they had but it was insufficient and sent out message to the governors asking them to send indigenous art. The governors were puzzled and said the Indians produced no art. After much explanation materials began to arrive. Dr. Atl was asked to write the catalogue for this exhibition and he took time in the publication to tell the audience how to see the materials. It was an instructive guide on a new way to see what had been seen as trinkets or simply functional materials. Atl was later asked to produce a second edition which grew to 480 pages and he now goes on at great length to justify the exhibition of this material and to guide people on how to see and understand it. The exhibition was widely successful and was a turning point in the use and production of “folk art”. Also in 1920 a very successful display was held in Chapultepec Park called “La Noche Mexicana”. The commission for preparing this was given to Adolfo Best Maugard and what he presented was revolutionary for the time. He made an attempt to create a peasant village with stalls decorated in the village way, Indian food was served and drinks of atole served in ceramic cups, the servers (mostly whites) were dressed in peasant clothing. For entertainment there was music from the villages and traditional dances. Of course there were also fireworks. This event was also a success. Best was appointed the director of the department of Drawing and Handicrafts in the Secretary of Public Education. He had worked for Franz Boas at Columbia University drawing the images found on countless fragments of ceramic pottery. From all of this as well as his natural talent he developed a theory and a method of drawing which he formulated in a book to teach school children to draw. Patrons of European art (or real art) were horrified at his method but children quickly became drawers and the book has never been out of print. Also in 1920 and 1921, Rivera, Orozco and Siquieros were given commissions to begin painting monumental art by painting on walls. The mural movement was born. All of these events which happened in a very short time were designed to “Indianize “ Mexico. Developing the groundwork for forming a nation with elements from indigenous cultures as the glue that was to hold people together. One is forced to ask, is this just appropriating indigenous culture for political purposes? Did it really changes the lives of those in the village? The state’s relationship to the market for indigenous art (handicrafts) was complicated and inconsistent. On the one hand some were reluctant to develop a market for fear this would contaminate the art work. It was thought to emerge spontaneously from the peasant subconscious. If they produced work for the market it would be different. The state did open a Museum of Folk Art in 1929 but it did not provide a vehicle for sales and the museum itself ultimately failed and much of the inventory placed in storage was lost to a fire. The current museum of popular rates was only opened in 2006 and has been enormously successful . There were also concern from this side that foreigners were romanticizing village life and their interest was leading to the commercialization of production. Others argued, of course, that a market is what the villages needed to survive and this should be encouraged. It wasn’t until the 1970s with the development of Fonart that a market was provided for quality indigenous art. Local markets of courses were always place to look for folk art. Banamex got into the market in 1998 with the publication of Great Masters of Popular Arts from the Banamex collection and with its foundation to support Mexico’s great folk art tradition and frequent exhibition of high quality items. The final chapter provides a brief case study of the town of Olinala to show how artisans operated. Although the production of lacquer products goes back many centuries and there is ample evidence they traded with the Aztecs they had great difficult in finding and reaching a market due to their physical isolation. It was only when artisans are able to be heard over the wishes of local leaders that the federal government built a road which shortened travel time to a few hours from a few days that they once again gained a market. What is most amazing about this book is that one begins to understand how successful Mexico was in creating a national identity. It achieved this long before other Latin American countries did. Also, one comes to see that this national identity was not built on language or on values but on aesthetics. When one thinks of Mexico one thinks of village foods, Indians festivals and masks, Indians folk art, colour and other physical things. Is there another country which has an identity built on the backs of a minority of the population? As a Canadian, Mexico was not part of my consciousness until I arrived in central Mexico and ended up spending a great deal of time in the region. The situation for Americans was quite different as their history was intimately connected to Mexico and it became the focus of advertising in the 1920s. There was a new found interest in Mexican art and there was travel between the two countries as well as efforts to exhibit and sell many things Mexican. With the relative stabilization of Mexico under president Obregón (1920-1924) and the malaise that set over many western nations after world war 1 there was great interest in the revolution as the new politics made space for progressive voices and nationalism. America had come to be seen as cautious, materialistic and boring as well as experiencing a surge of industrialization. Excitement, hope, social reform, new forms of art and “untouched” (i.e authentic) peoples were south of the border. Foreigners brought a rather romantic view with them and this was clearly met on their arrival. They were taken by the handcrafts of Mexico and saw in them a reflection of a society isolated from historical pressures and they a reflection of their authentic self. It wasn’t until 1923 that the USA formally recognized Mexico and still later until some of the tensions between the two diminished. However, people did not wait for all of this; they took a train to Mexico City. Mexico also became a gathering point for many revolutionaries from Latin America - Cuba, Venezuela - who had been exiled for their politics, being seen as too radical and threatening. Many of these people had a lasting impact on Mexico and the USA and others influenced developments in other countries. Patricia Albers in her biography of Tina Mondotti explains it best: Mexico City teemed with fanatics, bohemians, idealists, radical; and visionaries. Intellectuals who had once looked to Europe for cultural revelation now turned their backs upon the old continent, embracing instead the genius of peasants and indigenous peoples whose inclusion in the Mexican community promised to bring forth the regeneration and exaltation of the national spirit. The relationship to the indigenous peoples was difficult and full of contradictions. As noted in a previous post on “Night of the dead” and “ the old men” we saw a genuine interest in the indigenous Purépecha peoples but behind this we saw a tension between the past and the present. The indigenous people of the past were of interest (as perhaps captured by that difficult term “Mexican folkways”) but the relationship to real people was often different and contradictory. José Vasconcelos (1882-1959) provided a good example. In the government of Álvaro Obregón he was the minister of education and began the process of modernizing the education system and saw it as a vehicle for the creation of a common or national sense of belonging to a wider community. At the same time he was a firm believer in the creation of a new Mexican race where all of the indigenous people would disappear and become like everyone else. While many “foreigner” were in Mexico prior to 1920 it is this date which really marked a turning point. The following list is my working document but it may be of interest to others. I am sorry it is so long and so "rough" but please consider it as my working notes. Pablo O’Higgins, an Irish American, arrived in Mexico City in 1924 and was soon chosen to be an assistant to Diego Rivera on his murals. He became a well know artist painting several murals and being asked to do a mural in Mercado Abelardo Rodriguez. In the 1930s he introduced Marion Greenwood to the art of fresco mural work. In 1940 he was the only non-native to be chosen to exhibit work in the exhibition of Twenty Centuries of Mexican Art at the MOMA in New York. You can see many of his mural in the Mercado Abelardo Rodgruigez. Marion Greenwood and her sister Grace, both American. Marion arrived in Mexico City in 1932 and soon met Pablo O’Higgins who introduced her to the fresco mural style and recommended her to others. She went to Taxco where she painted a mural in a hotel owned by an American. Grace Joined Marion in Taxco and they went on to Morelia, Michocan to paint a mural. The governor wished to invite a number of artists to do mural work as a way to attract tourists to the city. They went on to paint murals in Morelia and in Mexico City. She returned to the US in 1937. See James Oles, The Mexican Mural of Grace and Marion Greenwood. also by same author, Walls to Paint on: American Muralist in Mexico 1933-36. Fred Davis, born in Illinois and arrived in Mexico City around 1910 working for the Sonora News Company selling newspapers and souvenirs on the train running to Arizona. He became a great collector of antiquities and local crafts. During and immediately after the revolution there were a number of antiquities flowing onto the market and Davis was able to open a store with his purchases. His store attracted the inteligensia and the artists of Mexico and Davis was an early exhibitor of the works of Rivera, Orozco, Tamyo and Spratling. Rene D’Harancourt, born in Vienna, arrived in Mexico City around 1927 and worked for Fred Davis. D’Harancourt often received commissions from rich Americans or Mexicans who wished to accumulate a collection of antiques and folk art for display in their homes. In 1929 he was commissioned to organize an exhibit of Mexican popular arts for the Museum of Modern Art in New York. There had been a similar exhibition in Mexico City and 1921 and this became his model. His exhibition was so popular in the USA that it travelled to 13 cities over 2 years. Went on to become the director of the Museum of Modern Art in NY. Tina Modotti (1896-1942): Modotti apprenticed with Weston and gained some recognition for her work. However, she became increasingly political, declaring she was a communist and was expelled from Mexico in 1929 after allegations that she murdered her lover. She returned under a false name in 1939. Modotti had a relationship with a Cuban in Mexico who was part of a large Latin American group of revolutionaries, many exiled from their own country. You can find images of Modotti in some of Diego Rivera’s early murals. See Patricia Albers (2002) Shadows, Fire, Snow; The Life of Tina Modotti. Or, Mildred Constantine (1993) Tina Modotti: A Fragile Life, or even Margaret Hooks ( 2000) Tina Modotti: Radical Photographer. Or to make the circle a little tighter check out the book by Elena Poniatowska (1932-), Tinísima (1991). Poniatowska was not born in Mexico although her Mexican grandmother left for Europe during the revolution. Poniatowska and her parents returned (in a sense) to Mexico in 1942 where Elena soon became actively involved in journalism, revealing a powerful social consciousness. She write in Spanish and has a long list of publication, many which are significant for understanding Mexico. Two in particular stand out: Massacre in Mexico (1971) (in English translation) which deals with the 1968 murder of students in Tlalelolco and the Nada, Nadie (1988) which deals with the 1985 earthquake and the failure of the political system to respond. Both of these events were transformative and are helpful for understanding Mexico today. You can find a biography of Poniatowska written by Michael Schuessler. Anita Brenner (1905-1974): Brenner was born in Aguascalientes, Mexico but her family left to live in Texas during the revolution. She returned in 1923 at age 18 with her parents (who were born in Latvia) fearing for their daughter they arranged for Frances Toor to keep an eye on her. Toor of course introduced her to the intellectual and cultural elite of the day. Reutrning to the USA in 1927 to do university work she remained active through putting Mexican artists in touch with Americans and speaking on their behalf. She remained in Mexico City until 1927 and did not return until 1940. In 1929 she published Idols Behind Altars, with some illustrations by Weston, and in 1943 The Wind that Swept Mexico, a story of the revolution. Both are still referred to today. You can find the diary/journal she kept from 1925-1930 edited by her daughter Susannah Glusker and including numerous great photos in Avant-Garde Art and Artists in Mexico (2010). Her daughter also wrote Anita Brenner: A mind of Her Own (2010). Frances Toor (1890-1956): Born into a large Jewish family in Latvia, Toor went to the USA as a child and then went to Mexico City in 1922, along with her husband who she divorced a few years later, to continue her studies and after three years she began publishing the immensely influential magazine Mexican Folkways which lasted until 1939. She was included in a 1923 or 1924 trip to Lake Patzcuaro where she witnessed night of the dead as well as Los Viejitos (the old men). This visit led to the use of images from these two events in the marketing of Mexico and becoming part of an effort to build a distinctive Mexican identity. The first issue of her magazine includes stories from that trip. In 1936 or 1938 she published a tourist guide to Mexico for a foreign audience, in 1939 a book on Mexican Popular Arts and in 1947 she published A Treasury of Mexican Folkways which went in to several printings and was influential in creating a sense of the vibrancy of indigenous life and the arts and crafts in Mexico. No one has done more to promote tourism to Mexico and to value the arts of the indigenous peoples. Toor also gave Aaron Copeland a copy of Cancioneros, songs she had collected in Mexico, and these formed the basis of his music known as El Salón México. This spurred Copeland to use American folk themes in his music. Frances Flynn Paine Born in Texas she spent many of her formative years in Mexico where her father was superintendent of the railway. Sshe became bilingual and had visited many quite remote parts of Mexico. In 1928 she received a grant from the Rockefeller Foundation to spend three years in Mexico where it seems she would help the Rockefellers acquire indigenous art but also develop relationships with Mexico. In 1929 while Abbey Rockefeller was founding the Museum of Modern Art she also worked with Frances Paine to establish an organization to promote friendships between the two nations. In 1931 Frances acting as a gent for Diego Rivera acquired a number of paintings for the Rockefellers and also secured funding for Rivera to go to New York to create a number of mobile murals as part of a Rivera show in 1931. Paine was also to set up a cooperative among Mexican folk artists and to assist in market their goods in the USA. Abby Rockefeller had visited Mexico in 1928 but Nelson made his first visits in 1930 under the guidance of Frances Paine. Now both husband and wife were in love with all things Mexican and they ended up with a collection of 3000 pieces. You can see some of this in Treasures of Mexican Folk Art, reflecting pieces in this collection. William Spratling (1900-1967), moved to Mexico in 1929 after spending 3-4 summers there during previous years. Immediately became part of the circle around Diego Rivera and assisted in having his works shown in New York. With his commission from that sale he moved to Taxco where he began to design silver, frequently using indigenous themes. Taxco became a minor centre for expats at this time. Walter Pach (1883-1958) was an artist, gallery owner and organizer. Pach was one of the people behind the Armory show in New York in 1919 and taught in Mexico City during the 1920s with an emphasis on indigenous art. He established an important link between the USA and Mexico and was instrumental in getting people like Rivera and Orozco shown in the USA. Paul Strand (1890-1976), an American photographer who had many styles was drawn to social reform photography, perhaps due to early experience with Robert Hines but also because of his socialist leanings. Only in Mexico from 1932-35 where he had a commission from the Mexican government to produce a film, Redes (1936) released in the USA as The wave. Andre Breton (1896-1966): Born in France and founder of the surrealist movement, was sent to Mexico in 1938 by the French government. In Mexico from 1938-40 where he became part of an hidden intellectual group in Erongaricuaro, Michoacán (about 20 minutes from Pátzcuaro). Diego Rivera and Frida Khalo would visit this group. He had the opportunity to write with Leon Trotsky who had arrived in Mexico in 1937 and assassinated in 1940. Carl Zigrosser (1891-1975) was a print collector and manager of the Wehye gallery until 1940 when he moved to Philadelphia Museum of Art to become the curator of prints and drawings. While he spent only a brief visit to Mexico he corresponded with many of the artists of his time and arranged for showing and the sale of their work. Until he emerged on the scene there was no where in the USA to purchase Mexican art. He also organized the exhibition of the works of José Guadalupe Posada in 1944. Ruth Lechuga (1920-2004): Arrived in Mexico in 1939 to escape the war in Europe, went on to become a photographer and anthropologist, creating a collection of indigenous art and objects of everyday life that is now on exhibition. The museum of her collection is well worth the visit. She was responsible for changing the the indigenous peoples of Mexico were perceived. Hugo Brehme (1882-1954), a photographer born in Germany, arrived in Mexico in 1908, expecting to stay only a short while. This turned into a lifetime. He published some famous photos of the revolution and was known for his pictoralism style. He met Manuel Alvarez Bravo (1902-2002) who was to become one of Mexico’s best known photographers in 1923. Bravo also met Tina Modotti, Diego Rivera, Paul Strand, Andre Breton, Carteir-Bresson and worked with Eisenstein on his movie about Mexico. He was more influenced by the formalism style of Weston and Mondotti. His mature work however, has a surrealist quality and he had an exhibition arranged by Andre Breton. Ione Robinson (1910-1989). Arrived in Mexico in 1929 and returned in 1931 with a Guggenheim grant to study art; she chose to work with Diego Rivera on the mural in the National Palace. For a short while she lived with Tina Mondotti in Mexico City. Politically focused all her life, she went to Spain in support of the republican side and in 1936 arranged for about 450 orphans to be sent to Morelia, Mexico. In 1939 she was again in Mexico to take photos of the children in Morelia. She is best know as a short story writer and in 1945 wrote an instructive piece on the bull fights in Mexico City. See her biography, A wall to paint on (1946). Perhaps the most interesting couple who became very influential were Dwight Morrow and his wife Elizabeth Cutter. Morrow was the US Ambassador to Mexico from 1927 to 1930 and arrived on the heels of an Ambassador who appeared to despise Mexicans and saw the society has primitive, backward and in need of civilization. There was much talk of the US invading again and tensions between the two countries were high. Morrow came at a difficult time but because of his approach and personality settled tensions and made a contribution. He met regularly with President Calles and is credited with helping resolve the “cristero war”, a struggle between the Catholic church and the state which could well have torn the nation apart once again. Morrow is a character in the 2012 movies For Greater Glory based on the cristero war. He loved Mexicans and adored the arts and crafts of the county and played a part in the promotion of the 1930 exhibition of folk wart in the United States. 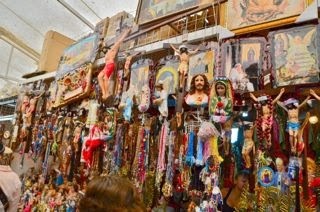 He and his wife built a home in Cuernevaca and filled it with Mexican antiquities and folk art. A good read is Wayne Gibson, Ambassador Morrow’s influence on the Calles Administration, 1952. The above list could continue but here is a brief mention of others. Margaret Shedd (1898-1986) lived off and on in Mexico and developed the Mexican Centre for Writers. Wolfgang Paalen, born in Vienna and leader of the abstract art movement, met Frida Kahlo when she was in Paris during 1938. He emigrated to the USA and in 1939 moved to Mexico living in a house next to Frida. He spent a great deal of time in Mexico and died in Taxco. Katherine Anne Porter a well known writer first visited Mexico in 1920 in time for the inauguration of president Obregón. Over the next 10 years she lived between New York City and Mexico City. Many of her writings reflect her experiences in Mexico. Eliabeth Catlett an artist who arrived in 1946. Charles Lindburg made his well publicized flight to Mexico in 1927 at the invitation of Ambassador Morrow. He was later to marry Morrow’s daughter Annie whom he had met in Mexico. Of course, in 1932 the baby of Charles and Annie was kidnapped and murdered resulting in the trial of the century. Frank Tannenbaum, a leftist, wrote several books about Mexico based on his travels, beginning in 1922. Carleton Beals, a socialist, first visited in 1918 and returned again in 1923, eventually to be exiled. Stuart Chase who visited Mexico in 1930 and wrote a much remarked upon book, Mexico: A Study of Two Americas (1931). Edward E. Ross, the sociologists, traveled to Mexico and wrote the Social Revolution In Mexico in 1923 and also lectured in MC in 1928. Eyler E. Simpson, a sociologist, was in Mexico from 1928 to 1935 and wrote, The Ejido: Mexico’s Way Out. (1937). Martha Graham, the famous dancer and teacher, visited in 1932. Robert Redfield the anthropologist was in Mexico in 1926 and wrote the very well known book, Tepoztlan, a Mexican Village: A study in Social Life (1930). This book and others continues to be reflected in the observations of visitors to Mexico who note that Mexico seems more authentic than the USA, more communal, more family based, has a less materialistic and individualistic attitude, and so on. By the end of the 30s and into the 40s countless anthropologist arrived in part to document life in rural villages just prior to the arrival of new highways that would open up the county. D. H. Lawrence arrived in 1923. John Dos Passos in 1926-27. John Dewey, the famous educator/philosopher in 1926. Elsie Clews Parsons, having received a PhD in 1898, made her first visit to Mitla in 1913 and returned between 1929 and 1933. The results of her work were published in 1936 as Mitla: The Town of Souls. Ryah Ludins knew Marion Greenwood and she too received a commission to paint a mural in the museum in Morelia (as did Grace Greenwood), Philip Guston (also known as Goldstein) was given a commission in 1934 to paint a mural in Maximillians Palace in Morelia, Michoacan. Reuben Kadish also pointed a mural in Morelia. Isamu Noguchi apparently drove to Mexico in a car he had borrowed from Buckminster Fuller in about 1933. He knew Marion Greenwood previously and she asked Rivera to offer Isamu a commission for mural in Mercado Abelardo Rodruigez. His work is quite unusual in that it is part sculpture and part painting, reminiscent of the last big work by Siquieros. Winold Reiss, a German born American, arrived in Mexico City in 1920 and drew portraits of the revolutionaries and of the heirs of the Aztecs. Appears to have been his only exposure to Mexico. Thomas Handforth, a prolific painter and etcher made a short trip to Mexico in the 1920 and produced a few works there. Doris Rosenthal, an American painter and printmaker made solitary expeditions to remote regions of Mexico in the 1930 (a photo shows her preparing for a trip in Patzcuaro). In 1943 a five page spread of her paintings and the story of her travels in Mexico appears in Life magazine. Marsden Hartley traveled to Mexico in 1932 with a Guggenheim Scholarship. He was overpowered by the light in Mexico and the landscape, the people the creatures. He did produce several paintings from his period. Helen Levitt, a photographer, went to Mexico City in 1941. She stayed way from middle-class neighbourhoods as she wanted to get photos of the poor. She used a camera with a 90 degree lens so her subjects would not believe she was taking their picture. She returned with many amazing photos which you can find in her book Helen Levitt: Mexico City, 1997. Josef Albers and his wife Anni, both born in Germany and part of the Bauhaus Schoool fled to the United States in 1933-34. They made their first visit to Mexico in 1935 but returned about 14 times. He was struck by the ancient architecture and took thousands of photos. They also collected 1300 object along the way, some of them antiquities and others just interesting things. His subsequent painting are modernist but one can see the architectural details reflected in them. Robert Motherwell made a trip to Mexico with Robert Matta. Motherwell was to become an abstract painter but his first serious work comes out Mexico and is published as My Mexican Sketchbook. If you choose to do further reading on this period I recommend Helen Delpar The Enormous Vogue of Things Mexican. (1992) as a starting place. While I have searched for Canadians who might have had a connection to Mexico in the 1920s all I have learned to date is 25,000 German Mennonites began moving from Canada to Northern Mexico in the 1920s. Malcolm Lowry, the author, also visited in 1936 but was deported in 1938, probably due to his alcoholism. Leonard Brooks mvdd to San Miguel de Allende in 1947 and is credited with playing a large role in turning the town into a artist colony. Arnold Belkin moved to Mexico in 1948 having been inspired by the works of Rivera. He meet Siquireros becoming his assistant on the mural at Bellas Artes in Mexico City. He carried on the tradition of Mexican mural painting as well as working on canvas. others who went to Mexico at this time were Jack Humphrey, Stanley Cosgrove and Isabelle Chestnut Reed. You might find the following book helpful, Leonard and Reeva Brooks: Artists in Exile in San Miguel Allende, 2001 by John Virtue. This list could gone on and on but we can imagine from the above the both countries benefitted from these relationships immensely. However, the role of foreigners was soon to become an issue and they were kept at the margins. This will be the subject of a related post as a later date. For those who want to know something of the political context behind this time period, here is a list of the Presidents of Mexico. There were 9 presidents from the deposing of Porfirio Diaz in 1911 to the election of Álvaro Obregón in 1920. Two of the 9 where assassinated, 3 were interim presidents (one for 45 minutes), 2 were exiled and 2 resigned under pressure. Álvaro Obregón (1920-24). He and Calles came to be seen as soft liberals and not the radicals that many expected. Plutarco Elias Calles (1924-28) Was a more cautious politician and lacked the interest in the art of cultural nationalism that was shared by Obregón and his circle. This made life for many artists more difficult and forced them to look to the USA for markets. Alvaro Obregón wins election as president and is assassinated two weeks later. Calles appoints Gill. This was the beginning of the PRI election machine. Emilio Portes Gill (1928-30) Gill was a puppet of Calles. Pazcual Ortiz Rubio (1930-32) Resigns early due to the undue influence of Gill. Abilardo Rodriguez (1932-34) He was an interim president. Lázaro Cárdenas (1934-40) Removes all of the people loyal to Calles from government and in 1936 forces Calles into exile. Also in 1936 he gives refuge to Trotsky who arrives in Jan. 1937. In 1937 he nationalizes the railway system and in 1938 nationalizes petroleum. So, much more progressive, some might say radical, politics. However, Cárdenas was a member of what became the PRI as were those going back to president Gill and this party remained in control until the election of Vicente Fox in 2000. In a previous post I reported I was reading Religion for Atheists by Alain de Botton, a book which seemed to be the answer to many questions about what it is that strikes me as special about the country of Mexico, especially the religious aspects of the country. Trained as a sociologists I kept thinking I saw “community”, that thing which sociologists felt had been in decline since 1850. Indeed Auguste Comte (1798-1857) the French sociologist, who first applied the name to a field of study, made significant contributions to our understanding of societal developments before attempting to create a religious-like program which would accomplish what religion had done previously. He saw community disappearing and wanted to rebuild it without religion. F. Toennies (18551936) made sociology’s concerns clearer when he developed the concepts of Gemeinschaft and Gesellschaft, the former term usually translated by “community” or a society held together by emotional and personal relationships. In this state we come to know each other more holistically, we tend to be more open and authentic and we feel more obliged to help others. The later is modern society where contractual relationships (at work, shopping and so on) bind people together. We live in a less charged emotional world, always try to present our best face and don’t really know those we even call friends. In the latter phase there is much less constraint on the ego and too often it “runs amok”. It creates the “me” generation and many of the other ills of society; the self is homeless and the ego becomes dominant and no one want to tell you when your behaviour is inappropriate since “nobody is the boss of me”. Friederick Nietzsche (1844-1900) coined the phrase “God is dead”, among others, and with this phrase encouraged us to abandon a belief in God. Religions were non-rational and humans, having created God, were capable of developing a rational basis for living, for morals, for relationships and so on. Into this context comes the book Religion for Atheists. It begins by suggesting the most boring question to ask is: is religion true? It is very simple to suggest that God and many of the stories of the Bible, or of any religion, do not stand up to the test of science. If instead we accept that God is dead and the various unsupportable claims made by religions are dismissed: What is left of religion? Is it of any use? To often the answer draws upon another concept from Nietzsche, “the bad odour of religion”, and we tend to reject everything. Even a hint of morality turns people off. All religions and their 2500 years of thinking about the human condition are dismissed. Nothing is left and we are on our own. We would rather believe the most recent research by psychologists than consider issues humans have thought about for centuries. We tend to believe that the past teaches us nothing. Botton suggests that all religions have two broad goals: First “the need to live together in harmony, despite our deeply rooted selfish and violent impulses. And second, the need to cope with terrifying degrees of pain which arise from our vulnerability to professional failure, to troubled relationships, to death of loved ones and to our own decay.” God may be dead but these two important needs continue to haunt us. Botton attempts to scavenge religious books to separate the non-rational from the helpful, suggesting there are many ingenious concepts with which to understand and perhaps solve the ills of secular society. If self-help books can be helpful why not 2500 years of religious thought. The Catholic mass is a beginning point. The mass works to breakdown many of the social divisions which separate us. People of all work, income or status groups come together to share, listen, sing and pray together. We are reminded very quickly that we are all in this together, we want the same attention and love from God. Second, we all listen to a very moral language and its lessons are repeated over and over. Third we are surrounded by the great moral figures of our history in the form of statuary. Fourth, the rituals of the occasion are often repeated and the audience plays an important role, responding to requirements to pray, to sing and to recite very common lines. All of these help unite people and the repetition drives home simple but important messages. Fifth, the very building in which the mass is conducted has been intentionally created to make us look up, be quiet and to realize how small we are. Our egos are all put in their proper place. Botton includes a whole chapter on architecture and I was struck by the debate which emerged during the reformation. Protestants were incensed at the money spent on Catholic churches and the extensive use of art work, statuary and so on. Protestants argued that the bible alone could work just fine even if in a simple home surrounded by the squalor of the growing industrialization. Catholics argued that we could only be uplifted in a beautiful location and they went on a building spree to illustrate their beliefs. It does seem that the Protestants were wrong on this issue and we now all appreciate the value of beautiful building, parks, streets and the value of untrammelled nature. All of these things appear to heal the spirit and protect it from the roughness of many parts of the community and of life. The author also takes us back to 1792 when revolutionary France separated the state from the Catholic church. Three days after this declaration the state opened the Louvre gallery, filling many of its rooms with objects stolen or confiscated from church buildings. In later years the theft of artifacts from churches further afield filled the halls. The museum was supposed to perform the same goals as the church but how were we to look at these works of art? Were we to pray? Simply adore them? What? Rather than to learn moral lessons from art we were expected to learn facts. This latter objective is often revealed in the museum-gallery itself - the development of art from 1650 to 1750, the art of painter X, the development of the style y. Lost of course is the moral point of view, we no longer look at a piece of religious art and find our self melting away and becoming part of the “other” - leading to opening ourselves, becoming less egotistical, more compassionate, thinking about the world, etc. Instead we are urged to examine the use of brush strokes, of colour, of perspective. Similarly when society set out on its secular path the universities said they could do what churches had previously done, particularly through the departments of humanities. Through the great literature of the world they would expose us to the human condition and to solutions to very human problems - grief, relational problems, our own vulnerability and failures. An examination of most universities however, shows that these grand ideals have been replaced by academic issues. We are introduced to surveys of the development of narrative, the style of 3 modern authors, the use of metaphor in literature, and so on. Lost is the moral instruction promised and we are left with a number of valuable books which we may read once and are left to gather our own lessons from the material. We are presented with more books than the great authors ever dreamed of and yet our souls remain untouched. If it were the church, students would read less, reread more often and read with the intention of exploring the moral dilemmas inherent in the stories. Botton does not confine himself to Catholicism, drawing useful lessons from Judaism and Buddhism. One example from Judaism is the day of atonement when you are required to review the past year to identify instances when you hurt someone. You are then required to seek them out and apologize. The receiver is obliged to appreciate your thought and effort and to forgive. In this way small hurts are dealt with before they become disruptive of relationships. In Buddhism we find the practise of meditation where one is led through a process of breathing, focussing on elements of the body until the ego is silenced if even for a few moments. With repetition the ego is tamed and one is more open to your own needs and to the needs of others. If all of this can be generalized it is by seeing that these religions see the self (or our ego) as a source of a great many problems. They have each found useful solutions in order to reduce the barriers between people, to take us out of ourselves so we can appreciate others, to impart moral lessons, to imagine the suffering of others, to talk about our feelings and vulnerabilities and to live and work together. All religions realized another important part of the human condition: we all have best of intentions but forget our commitment shortly thereafter. This is most clear to us on January 10 when our New Year resolutions are broken and put away until next January. Religions are built around practice so that we continue to hear that voice in our head - “keep pedaling”. Reading this book has given some clarity to why it is that I do not believe in God and at the same time get weepy when I witness community events and religious ritual in Mexico. I have always thought it was about more than the God thing. If you have read this blog previously you will recall that I wrote about the number of religious images where I assumed this revewaled a process of democratization of religious power. No longer centered in the institution nor in a single image (Christ or Guadalupe) power is transferred to simple images in metal or to photos, posters, small replicas of a saint. Here I want to talk briefly about the history of this process. Is this just an example of consumer "stuff" or is it a display of power? I have been reading Religion for Atheists by Alain de Botton and found it fascinating and challenging. His basic thesis is that as the West became increasingly secularized we began to dismiss any religion (God was dead) and in this process we threw out the baby with the bathwater - or perhaps throwing out the bathwater with the baby. After 2500 years of history we havediscarded everything these religions knew about the problems of the "soul"and the building of community. I will return to this book in a separate post but here only want to report on a little history. When the Spanish conquered Mexico they introduced the same polices. When ever they found a site sacred to the local people they erected a cross or built a church. 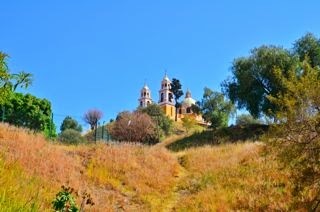 I recently visited the city of Puebla and small town of Cholula. In each of these locations you can't help but be struck by the number of beautiful churches. In Cholula which was a sacred site for the large pre-columbian population Cortez vowed to build 365 church, one to replace every temple he had destroyed. I think you would be hard pressed to find all these churches but there are indeed many churches and some of the most amazing in the county. One of these is the church of the Virgen de los Remedios begun in 1574 (replacing a cross that had twice been destroyed by lightening. The image of the Virgin (only 27 cm high) was apparently brought from Spain with one of Cortez's troops who buried it after a terrible defeat by the Aztecs. During the next battle the Spanish troops saw a young girl throwing dirt into the eyes of the Aztecs resulting in their defeat Perhaps the young girl was the Virgin herself . The image was thought to have brought them success. The church itself is built on top of one of the great pyramids of the world. Cortez probably wasn't aware that a pyramid was there as it had been vacated and was covered in trees and grass. Exploration of the pyramid was first begun in 1930 and while a small section has been reconstructed it is still covered in grass and trees. The image of the Virgin was first referred to as Our Lady of Victory, but in 1594 was renamed the Virgin of Remedies. For the indigenous peoples the site was associated with the god of rain. It is still a sacred site for the indigenous population (being one of several sites visited by the Conchero dancers each year) as well as for Catholics. A view of Los Remedios as you climb up the pyramid. 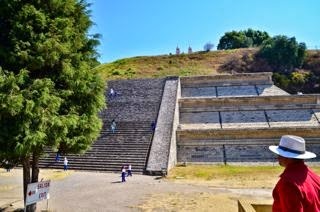 The small section of reconstruction with the top of Los Remedios just showing on top of the pyramid. 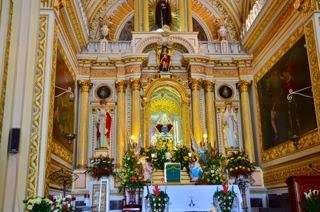 Inside of Los Remedios with the small virgin (27cm tall) above the alter. These few details helped me to see that the process of the Christianization of Mexico was not unique and the presence of a plethora of religious images goes back almost 1600 years. A few more words on the image of the Virgin. 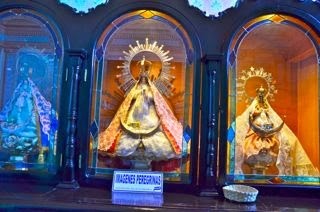 Upon seeing the Virgin I was convinced it was the same image as found in Patzcuaro, Neustra Senora de la Salud. Although the image in Patzcuaro is much larger and made by the local idigenous population of pasta de cana it bears a remarkable likeness to that at Los Remedios. One exception is that the Virgin of Los Remedios is carrying a small Christ child in her am. One often wonders where Vasco de Quirroga found the inspiration for his image; it now seems possible it may have come from Cholula. Indeed he may have known the image in Spain. 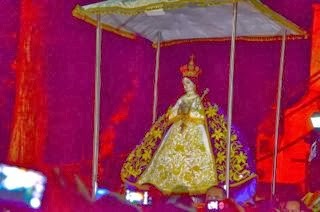 A photo of the replica of the Virgin of Los Remedios. Notice the moon at the bottom and in her hands there is a small Christ child. La Senora de la Salud during a pilgrimage in Patzcuaro. Notice that she holds a rosary in her hands (but the original in the basilica has a small moon at her feet). Reading: Alain de Botton, Religion for Atheists. I’m sure you have had this experience. You read something and soon discover that you really hadn’t understood something you previously believed you were familiar with. I recently had this experience twice in one week - enough to shake ones sense of reality. The first “shake” occurred while reading Wade Davis’ recent book on the life of George Mallory (Into the Silence). The book casts a sufficiently wide net to allow the reader to set the first attempts on Mount Everest in a political and cultural context and there is sufficient detail on the actual climbs that one feels you were there. One element of that broad context was World War 1 as all of the members of the first attempt on the mountain had been in the war or experienced the loss of countless family and friends. Davis’ account of World War 1 is graphic and at the same time almost poetic; an amazing piece of writing. I have been privileged to be part of a generation for whom war was not a personal reality; I knew from an early age I was not going to join the military and given the times was quite anti-military. However, my father and two uncles had been in World War 2, my wife’s uncle had died in World War 1, but that is now 90 years in the past and an aunt I never knew lost her husband in World War 1. So, I had to ask myself why I never knew, or cared to know, about the most terrible war in history. Why didn’t the numbers of dead from that war ever get through to me previously? I really don’t know. I did, however, go back through family histories and very quickly came up with a list of 16 men who had served in the war, 4 of whom died from injuries. So now this was has my attention. Primarily in terms of the social consequences of this horrendous event on communities and on societies as well as on individual men as in the story of George Mallory. The second shake was on reading Massacre in Mexico (1971) by Elena Poniatowska. Poniatowska spent her career as a journalist and when it came to the two most significant events in Mexican history of the past 50 years she developed a very modern style. Rather than tell her story or attempt to provide an analysis of the event she simply let people speak for themselves. Almost the entirety of the book is made up of short clips from interviews with people. It is like reading a contemporary twitter feed from the front lines. The reader gradually pieces events together and forms a powerful image of what happened. The event of course was the state killing of approximately 320 students at the Plaza of Three Cultures located at Tlateloloco just days before the 1968 olympics were to begin in Mexico City. Student protests had been going on for some time regarding significant issues of the time (not about tuition, etc) and as the Olympics approached it seemed that the government made a decision to bring events to a close. Although there is not a strong consensus about events because of the technology available and the ability of the government to control the press and to intercept any photos which may have come out of the plaza. The strong view, and I think the right view, is that the military prepared and then virtually trapped the students in the plaza and assisted by an armed helicopter and forces with machine guns, bayonets, and guns set about killing as many people as they could. We have become accustomed to the police roughing up protesters and occasionally wounding them or, as in the case at Kent State University, killing four and wounding 9 others. More intentional incidents are associated with communist states like China (Tiananmen Square, 1989) or autocratic states where dissent is not tolerated and few are able to resist without serious repercussions. But here was Mexico, our neighbor, engaging in behaviour which should not have been tolerated at a state level. Further, I was old enough and developing sufficient political consciousness to be more aware. The 1967 Detroit Riots were close at hand, resulting in 43 deaths. and this did shape my political awareness of the USA. I should have known to expect the worst of politicians. I have now started reading Thinking, Fast and Slow and things may never be the same for me. Although, for any thinking person, it is not new, the way the author frames the analysis is does leave you at least trembling. As a Canadian, Mexico was not part of my consciousness until I arrived in central Mexico and ended up spending a great deal of time in the region. The situation for Americans was quite different as their history was intimately connected to Mexico and it became the focus of advertising in the 1920s. There was a new found interest in Mexican art and there was travel between the two countries as well as efforts to exhibit and sell many things Mexican. With the relative stabilization of Mexico under president Obregón (1920-1924) and the malaise that set over many western nations after world war 1 there was great interest in the revolution as the new politics made space for progressive voices and nationalism. America had come to be seen as cautious, materialistic and boring. Excitement, hope, social reform, new forms of art and “untouched” (i.e authentic) peoples were south of the border. It wasn’t until 1923 that the USA formally recognized Mexico and still later until some of the tension between the two diminished. However, people did not wait for all of this; they took a train to Mexico City. Mexico also became a gathering point for many revolutionaries from Latin America - Cuba, Venezuela - who had been exiled for their politics, being seen as too radical and threatening. Many of these people had a lasting impact on Mexico and the USA and others influenced developments in other countries. Patricia Albers in her biography of Tina Mondotti explains it best: Mexico City teemed with fanatics, bohemians, idealists, radical; and visionaries. Intellectuals who had once looked to Europe for cultural revelation now turned their backs upon the old continent, embracing instead the genius of peasants and indigenous peoples whose inclusion in the Mexican community promised to bring forth the regeneration and exaltation of the national spirit. The relationship to the indigenous peoples was difficult and full of contradictions. As noted in a previous post on “Night of the dead the old men” we saw a genuine interest in the indigenous Purépecha peoples but behind this we saw a tension between the past and the present. The indigenous people of the past were of interest (as perhaps captured by that difficult term “Mexican folkways”) but the relationship to real people was often different and contradictory. José Vasconcelos (1882-1959) provided a good example. In the government of Álvaro Obregón he was the minister of education and began the process of modernizing the education system and saw it as a vehicle for the creation of a common or national sense of belonging to a wider community. At the same time he was a firm believer in the creation of a new Mexican race where all of the indigenous people would disappear and become like everyone else. Anita Brenner (1905-1974): Brenner was born in Aguascalientes, Mexico but her family left to live in Texas during the revolution. She returned in 1923 and immediately became part of the intellectual and cultural life of the new republic. She remained in Mexico City until 1927 and did not return until 1940. In 1929 she published Idols Behind Altars, with some illustrations by Weston, and in 1943 The Wind that Swept Mexico, a story of the revolution. Both are still referred to today. You can find the diary/journal she kept from 1925-1930 edited by her daughter Susannah Glusker and including numerous great photos in Avant-Garde Art and Artists in Mexico (2010). Her daughter also wrote Anita Brenner: A mind of Her Own (2010). Frances Toor (1890-1956): Born into a large Jewish family, Toor went to Mexico City in 1922, along with her husband who she divorced a few years later, to continue her studies and after three years she began publishing the immensely influential magazine Mexican Folkways which lasted until 1939. As we know from the post on Night of the dead and the old men as symbols, she was included in a 1923 or 1924 trip to Lake Patzcuaro where she witnessed night of the dead as well as Los Viejitos (the old men). The first issue of her magazine includes stories from that trip. In 1936 or 1938 she published a tourist guide to Mexico for a foreign audience, in 1939 a book on Mexican Popular Arts and in 1947 she published A Treasury of Mexican Folkways which went in to several printings and was influential in creating a sense of the vibrancy of indigenous life and the arts and crafts in Mexico. No one has done more to promote tourism to Mexico and to value the arts of the indigenous peoples. Toor also gave Aaron Copeland a copy of Cancioneros, songs she had collected in Mexico, and these formed the basis of his music known as El Salón México. This spurred Copeland to use American folk themes in his music. William Spratling (1900-1967): Moved to Mexico in 1929 after spending 3-4 summers there during previous years. Immediately became part of the circle around Diego Rivera and assisted in having his works shown in New York. With his commission from that sale he moved to Taxco where he began to design silver, frequently using indigenous themes. Taxco became a minor centre for expats at this time. Walter Pach (1883-1958): artists, gallery owner and organizer. Pach was one of the people behind the armory show in New York in 1919 and taught in Mexico City during the 1920s with an emphasis on indigenous art. He established an important link between the USA and Mexico and was instrumental in getting people like Rivera and Orozco shown in the USA. Paul Strand (1890-1976): An American photographer who had many styles was drawn to social reform photography, perhaps due to early experience with Robert Hines but also because of his socialist leanings. Only in Mexico from 1932-35 where he had a commission from the Mexican government to produce a film, Redes (1936) released in the USA as The wave. Carl Zigrosser (1891-1975). Was a print collector and manager of the Wehye gallery until 1940 when he moved to Philadelphia Museum of Art to become the curator of prints and drawings. While he spent only a brief visit to Mexico he corresponded with many of the artists of his time and arranged for showing and the sale of their work. Until he emerged on the scene there was no where in the USA to purchase Mexican art. He also organized the exhibition of the works of José Guadalupe Posada in 1944. Ruth Lechuga (1920-2004): Arrived in Mexico in 1939 to escape the war in Europe, went on to become a photographer and anthropologist, creating a collection of indigenous art and objects of everyday life that is now on exhibition. The museum of her collection is well worth the visit. She was responsible for a change in which the indigenous peoples of Mexico were perceived. The above list could continue but here is a brief mention of others. Margaret Shedd (1898-1986) lived off and on in Mexico and developed the Mexican Centre for Writers. Katherine Anne Porter a well know writer first visited Mexico in 1920 in time for the inauguration of president Obregón. She made many visits and her writings reflected her experiences there. Eliabeth Catlett an artist who arrived in 1946. Rene Harnoncourt arrived in 1926 and was among the first art curator to exhibit Mexican works in the USA. Charles Lindburg made his well publicized flight to Mexico in 1927. Frank Tannenbaum, a leftist, wrote several books about Mexico based on his travels, beginning in 1922. Carleton Beals, a socialist, first visited in 1918 and returned again in 1923, eventually to be exiled. Stuart Chase who visited Mexico in 1930 and wrote a much remarked upon book, Mexico: A Study of Two Americas (1931). Edward E. Ross, the sociologists, traveled to Mexico and wrote the Social Revolution In Mexico in 1923 and also lectured in MC in 1928. Eyler E. Simpson, a sociologist, was in Mexico from 1928 to 1935 and wrote, The Ejido: Mexico’s Way Out. (1937). Martha Graham, the famous dancer and teacher, visited in 1932. Robert Redfield was in Mexico in 1926 and wrote the very well known book, Tepoztlan, a Mexican Village: A study in Social Life (1930). This book and others continues to be reflected in the observations of visitors to Mexico who note that Mexico seems more authentic than the USA, more communal, more family based, has a less materialistic and individualistic attitude, and so on. D. H. Lawrence arrived in 1923. John Dos Passos in 1926-27. John Dewey, the famous educator/philosopher in 1926. Elsie Clews Parsons, having received a PhD in 1898, made her first visit to Mitla in 1913 and returned between 1929 and 1933. The results of her work were published in 1936 as Mitla: The Town of Souls. While I have searched for Canadians who might have had a connection to Mexico in the 1920s all I have learned to date is 25,000 German Mennonites began moving from Canada to Northern Mexico in the 1920s. Mexican Masks: Their Uses and Symbolism (1980) by Donald Cordry. Still a very useful book for your collectiion. Religion for Atheists by Alain de Botton. The Dialogical Theatre: Dramatizations of the Conquest of Mexico and the Question of the Other. (1996) by Max Harris. Carnival and Other Christian Festivals (2003) Collection of essays by Max Harris. From rituatlization to performativity: the Concheros of Mexico. Susanna Rostas in Felicia Hughes-Freeland (1998) Ritual, Performance,Media.